The wide-ranging survey touches on a number of issues, including the use of USB ports and external disc drives, Web-based file storage and syncing, and use of certain function keys on the keyboard. It also includes a number of queries related to wireless 3G data connectivity, suggesting Apple could be exploring integrated cellular radios in future notebooks. Apple gauging the popularity and usage of certain functions on its new MacBook Air could also be used by the company to determine which it can ax —or may need to add —to satisfy consumers. 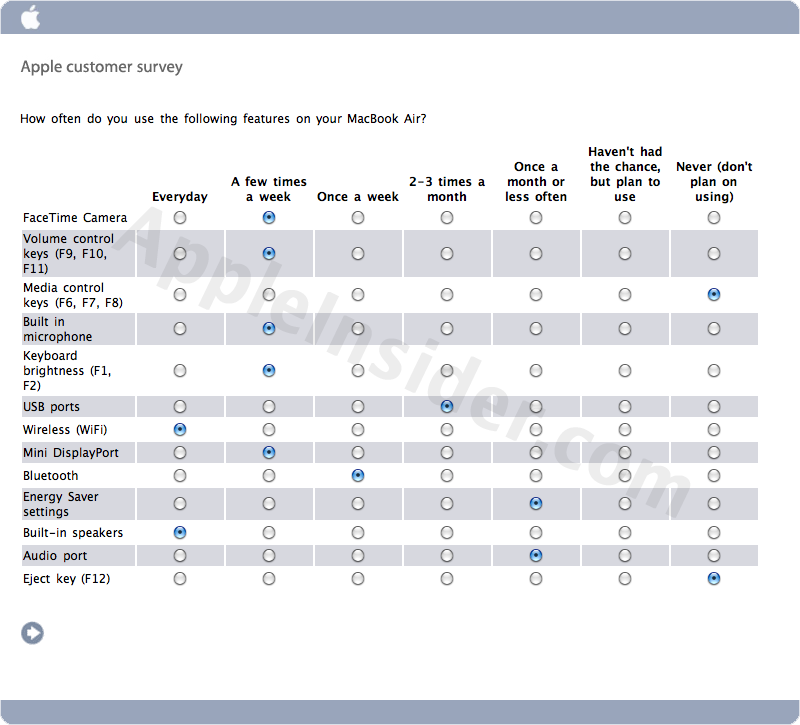 Official Apple customer surveys on products are not unheard of, though they are rare. 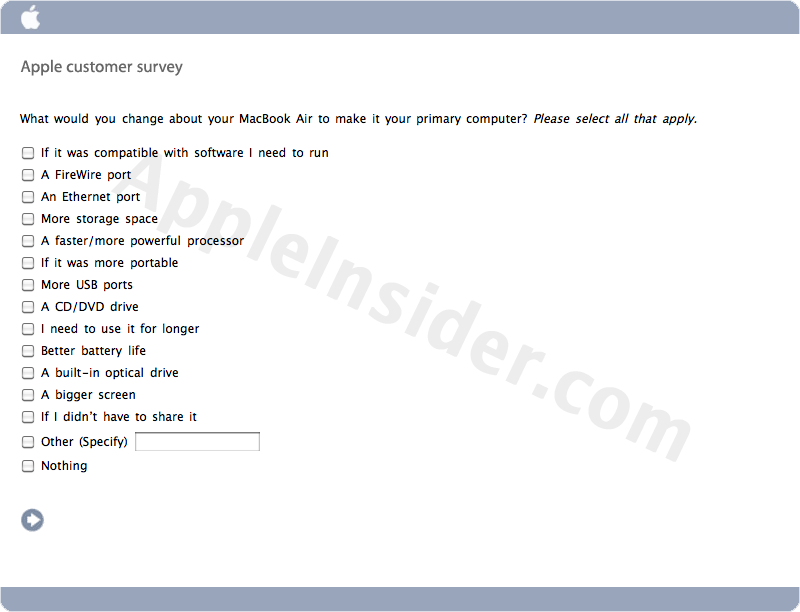 The last survey AppleInsider can recall was conducted back in February 2009 to help shape the future of the Apple TV, and that was related to the company's self-proclaimed "hobby" that was a work-in-progress. In addition to future MacBook Air models, the new survey could offer a glimpse into Apple's plans for the MacBook Pro line of notebooks. When the new MacBook Air was released last October, Apple Chief Executive Steve Jobs said the thin-and-light computer is "the first of a new generation of notebooks." What would you change to make your MacBook Air your primary Mac? Data syncing: Inquiries about what services are used (MobileMe, DropBox, Windows Live Mesh), and where files, data and photos are stored. Likely gauging interest and use for its newly launched Mac App Store, the survey asks how users load applications onto their MacBook Air, including from App Store, with the use of an External SuperDrive, or directly from the developer website. Port usage: Questions about how often both USB ports on the MacBook Air are in use, and how often the Mini DisplayPort is accessed. Keyboard usage: Those surveyed are asked to share how frequently they use certain function keys for features like volume control, brightness and media. External accessories: What hardware and devices are plugged into the MacBook Air for use, and how frequently are they used? Users were also asked if they own an iPad in addition to the new MacBook Air. 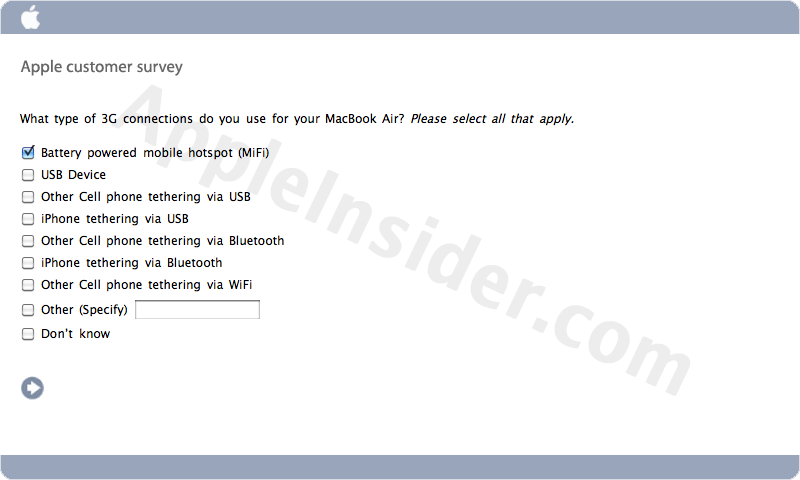 The survey asks if they bought their iPad before they purchased the MacBook Air, why they own both devices, and which they prefer to use for certain activities. Though the redesigned MacBook Air launched in late 2010, rumors of its successor have already begun to surface. Last week, it was said that Apple allegedly plans to upgrade its line of thin-and-light notebooks to Intel's latest-generation Sandy Bridge processors this June. 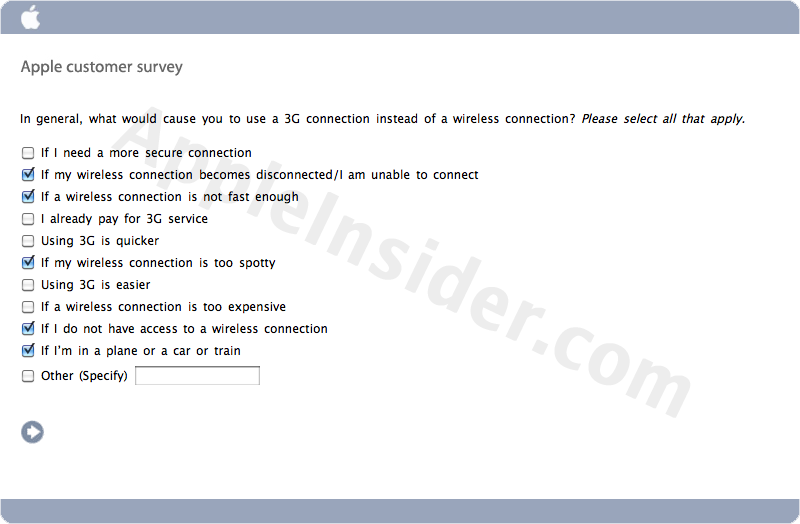 No claims were made about 3G connectivity. Rumors of a 3G-capable Mac have persisted for years, but the company does not yet sell a notebook with an integrated cellular data radio. Apple even sought to hire a 3G expert for its Mac team in 2009, fueling those rumors that the functionality would be added to a future MacBook.